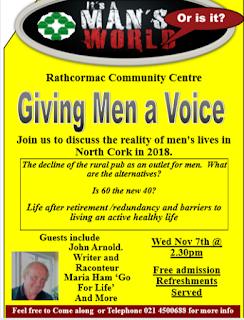 Cork County Muintir na Tire News: Feedback from ‘Giving Men a Voice Seminar in Rathcormac. Feedback from ‘Giving Men a Voice Seminar in Rathcormac. This event was held in Rathcormac Community Centre on the afternoon of Wednesday 7th November 2018 in conjunction with Rathcormac Community Council and supported by the Community Work Department HSE Cork North. 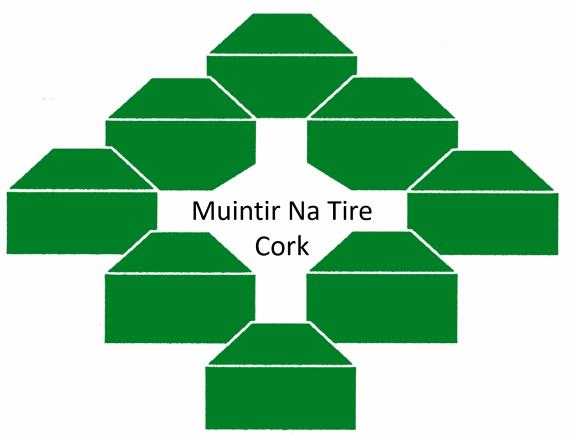 The event was split into two discussion sessions and was facilitated by Muintir's Finbarr Motherway. Maria Ham of Go For Life commenced with a warm up session and information was provided by Ger O Connor of Ballyhoura Befriending service and Mary Allen of Avondhu Blackwater Community Connect. John Arnold provided an insightful funny and thought provoking finale to a very enjoyable afternoon. During the sessions we posed some questions to the 30 participants of which there were 24 men and six women. See below the questions and responses. Q. I think the local pub is a good place for socializing and catching up with friends. Benefits of a local pub in rural Ireland. Most agreed that the pub was a good place to socialise and meet up for the following reasons. o For family and community events eg Birthdays After funerals etc. o It is a neutral venue where you can meet up with friends, meet the locals, stay in contact, catch up on local news and gossip. o A place to share problems. o Good for single men and country bachelors. o A place for newcomers to get acquainted with the locals. o Sometimes the only place to go. o Some small communities would be decimated if they lost the local pub. o Good for socialising and you would be sure to meet somebody. o Depending on venue the pub can be good for non-drinkers too eg have tea coffee minerals, food. o Great for music and entertainment if not too loud. Disadvantages of the pub being the centre of social activities in rural Ireland? Some suggested that the pub should not be the centre of social activities because of the following. o Pubs can be dangerous when lots of alcohol has been consumed. o May encourage over indulgence and cause family, health and social problems. Friction in the home. o Encourage Drinking as a habit. Q 2 There are many good alternatives to socializing in the local Pub. · Where can I catch up with my friends? When we had a local pub, I could just drop in of an evening and meet up with people. o The local Men’s Shed group. Local men’s club sports clubs. o Bingo, Card Playing eg 45 drives. o Groups of interest eg dancing, waltzing. o Walking groups, Active retirement. o Hobbies, Gym, Toastmaster. Social initiative group. o Drama Groups. Tea Coffee mornings. What Barriers do men face in maintaining their mental wellness? What prevents me from having a strong mental outlook? Prompts………Money worries. Health problems? Lack of transport? Lack of places to go? I’m shy? Lack of confidence? Lack of motivation? I’m over the hill? Others? o Unfamiliar with technology, Dealing with big companies on phone, safety fears lack of Gardaí, Not prepared for old age and Anxiety. What kind of activities do you currently take part in to maintain your physical health? Prompts…………Swim? Jog? Walk? Hill walking? Dancing, golf Pitch n Putt, gardening, cycling, aerobics, Tai Chi or Yoga? We didn’t have much time to deal with this question on the day but most responded that they were reasonably fit both mentally and physically and took part in some of the above activities. What types of clubs/ groups/skills would you like to join/learn or have nearby to maintain your physical and mental wellness ? There are many options for men to join including Fermoy Mens Clubs who organise a variety of activities and talks for their members. Membership is not confined to Fermoy residents but is open to all men in the area. There are Men’s Sheds in Fermoy and Carrignavar Mens Shed has recently been set up also. A stickmakers club and allotments were also identified as an option for men. The list identified from responses to question two also offer many possibilities for men to join and get involved, learn new skills and help out in your community. Meals on wheels and joining a community council were also identified as good ways to feel good about yourself. The participants felt that the questions posed were amenable, positive and practical and they were happy with the format, which led to a free flowing discussion in which everybody took part.